You wouldn't think that in a town of 1,200 souls (as in our little berg, Port Orford), someone of unusual artistic talent could conceal it for long. Perhaps I've exagerrated the case; there were apparently quite a few people who know about Elaine Owen's ability, but we weren't aware of it until there was a small exhibition of her photographs at our town's beautiful, nearly-new library. To say that we were impressed is an understatement, but when we learned that Elaine was using a simple point-and-shoot camera, and didn't use any form of Photoshop or other editing software, we were downright blown away! We're not the only ones to recognize her talent. 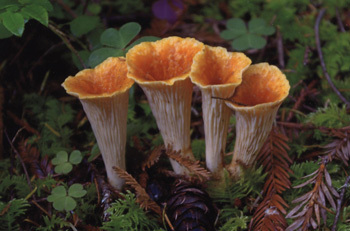 The respected Cascade Mycological Society of Eugene, Oregon recently chose one of her photograpks (featuring 4 Wooly Chanterelles - Turbinellus floccosus - posed as pretty as can be!) as one of the winners of their 2014 photo contest! Elaine has an art school background, which certainly shows in her eye for composition and color, but that doesn't completely account for the results she gets; she's just, plain talented! She still does without Photoshop, but she recently upgraded to a good quality DSLR camera. Here are some of her recent photographs, which she graciously allowed us to publish. There will be more, if we get our wish! April, 2014's Recipe of the Month: Sherri William's "Mama's Whiskied-Up Rib-Eye Tips & Shrooms over Fusilli"
"I cooked my first meal for my family at the ripe old age of 12. That’s when my love and passion for cooking began. My greatest food inspiration was Grandma Logan who created the most amazing meals from her very modest kitchen. I know she is just tickled pink over my cooking adventures and surely smiling from the heavens above. I’ve been blessed to participate in a few cook-offs across the country in the last 3 years since entering the competitive cooking arena. 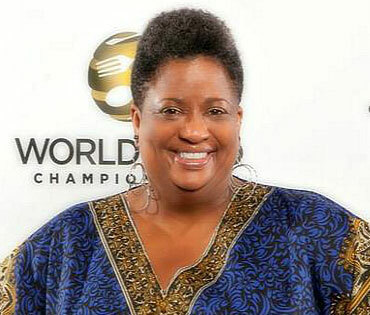 I've won over 50 cooking contests, had recipes published in cookbooks, magazines and newspapers. I've also appeared on WKRG TV out of Mobile, Alabama on their noon cooking segment 3 times. Last year I appeared on the Today Show frying up my spicy wings. This year I won the Good Morning America's Ultimate Game Day Grub Contest and appeared on the show via Skype. There is nothing more pleasurable to me than cooking, creating, sharing and swapping recipes." 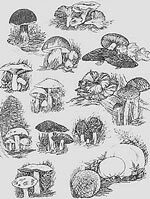 Sherri says that mushrooms are a staple in her home. In fact, she's never met a mushroom that she didn't love! And we loved how she incorporated them into "Mama's Whiskied-Up Rib-Eye Tips & Shrooms over Fusilli Pasta," elevating the mushrooms and the dish into something quite extraordinary.